which is NICEIC approved and offers the range of services listed below. We are happy to provide electrical work only (ie: should you have your own building or plumbing contractors) as well as offering our complete building service as detailed on this website. 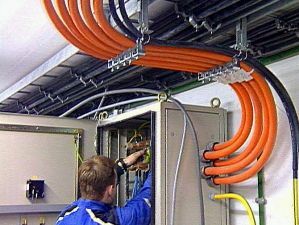 Commercial: lighting, power, telephone, computer networking, TV distribution, CCTV and electric heating. Industrial: 3-phase distribution, motors and controls. Domestic: We are able to meet the requirements of the new domestic building regulations 'Part P' for domestic works in specific locations such as kitchens, bathrooms and gardens. This work now needs certification and notification to building control to enable a problem free sale of your property in the future, when it is most common for electrical installation to be reviewed by surveyors and estate agents. We offer periodic test inspections and reports as recommended by current electrical regulations BS 7671, portable appliance testing - typically every year, also fire alarms and emergency lighting. We offer a range of security alarm solutions including: hard wired, wireless, remote signalling where keyholder response is needed on 24-hour manned central stations.